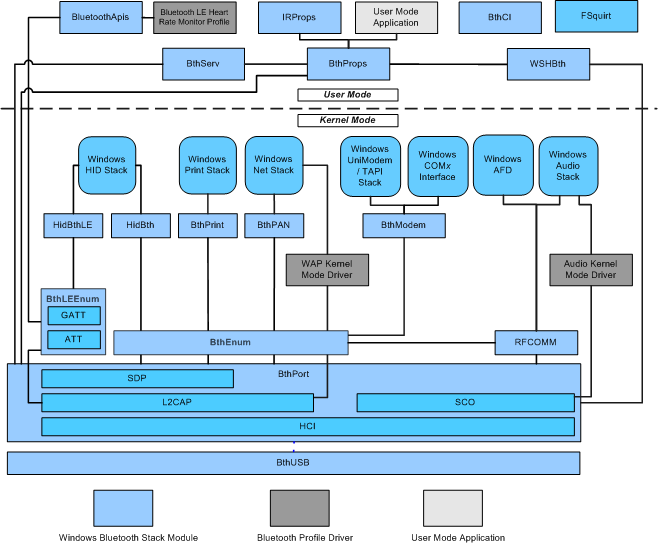 Audio Kernel Mode Driver- An example of a profile driver that communicates between the Windows audio stack and BthPort, accessing the SCO interfaces contained in the latter. Possible profiles include the Hands Free profile (HFP), Headset profile (HSP), Cordless Telephony profile (CTP), and Intercom profile (ICP).Note This profile driver is included with Windows beginning with Windows 8. BthModem- The component that implements virtual COM ports and dial-up networking (DUN). BthModem directs all I/O and control operations to RfComm through a TDI interface. The upper edge of BthModem communicates with Serial.sys to give the appearance of being a wireless COM port.Note This component is not available in Windows RT.